When we wrote this, there was a Wright B Flyer lookalike at the Dayton-Wright Brothers Airport called “Silver Bird”. Sadly that one crashed. We’ve kept their original press release about the plane here. They are busy trying to get funding to build yet another. The original “Brown Bird” is still flying. So sad about the crash of the Wright B Flyer lookalike and the death of the test pilots. I didn't want to write about this, but I decided I should. It was this newer "Silver Bird" that crashed. They were still trying to fly it for the 40 hours needed to get it certified. It crashed after 25 hours of flight time on June 30, 2011. A one-of-a-kind airplane designed to showcase Dayton’s aviation heritage around the world has been off the ground and is ready for a formal flight test program to begin next spring, the all-volunteer group that built it announced today. 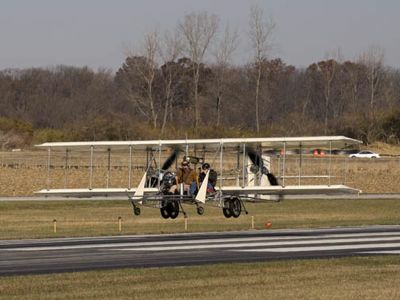 Since October, volunteer test pilots have put Wright “B” Flyer No. 002 through a series of low- and high-speed taxi tests at Dayton-Wright Brothers Airport, where Wright “B” Flyer Inc. has its hangar and museum. Pilots also have made 76 brief hops in which the airplane rose several feet into the air but remained above the runway. Wright “B” Flyer timed the announcement to coincide with the 107th anniversary of the Wright Brothers’ first powered flights in Kitty Hawk, N.C. Wilbur and Orville Wright invented the airplane in their West Dayton bicycle shop; the Dayton-built Model B was their first production airplane. ...but resembles the Wright brothers’ first production flyer, the Model B. 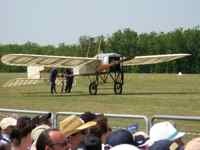 ...one that was easy to ship, assemble and fly at international events. The organization’s flagship Model B, the familiar “Brown Bird,” has been flown at events across the United States and shipped as far as Berlin, Germany, for displays. But tearing it down, shipping it, and making it flyable again is expensive and takes a large crew of skilled volunteers. In contrast, a few people can load the Silver Bird into a standard cargo container for economical shipment anywhere in the world, then unload it and be ready to fly in a few hours. “This airplane extends our reach in promoting our aviation heritage and Ohio’s aerospace business. We used to have regional markets. We have a global market today, and there’s no place in the world we can’t take this airplane,” said John Bosch, chairman of Wright “B” Flyer’s board of trustees. The Brown Bird will continue to fly at local events and make orientation flights for Wright “B” Flyer’s Honorary Aviator members. The Silver Bird sports a modern engine, modern controls and modern materials, but its drive system is unique – a modern version of the century-old Wright system that used chains and sprockets to turn two propellers with a single engine. The drive system proved to be one of the most challenging parts of the project, requiring numerous design changes and adjustments before it ran smoothly. The pilots decided to test it thoroughly with scores of low hops prior to a full-fledged flight. “These runway test flights have provided a high degree of confidence in the drive system and, after a few refinements to the aircraft and a few more tests runs, it should be ready for the first up-and-away official test flight in the spring.” said Don Gum, director of the production project and one of the test pilots. “This plane is a great marketing tool for the National Aviation Heritage Area as it has the portability to allow people anywhere in the world to experience the accomplishments of the Wright brothers and the airplanes they built here in Dayton,” said Tony Sculimbrene, executive director of the National Aviation Heritage Alliance. NAHA is the federally chartered management entity for the eight-county Heritage Area surrounding Dayton, and Wright “B” Flyer is a NAHA partner. Wright “B” Flyer hopes to begin flight-testing in early spring. Gum said it could take as little as two to three months, but the program’s pace depends on technical issues, weather, and the volunteer pilots’ personal schedules. Remember, the "Brown Bird" is still flying. They would love to have you see her and make a donation. 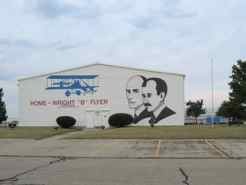 Ohioans can support Wright B Flyer Lookalike organization by purchasing “Leader inFlight" license plates for their cars and trucks from the Bureau of Motor Vehicles. Fifteen dollars of the $25 fee goes to Wright B Flyer. Organizations and companies can support it with cash and in-kind donations, and the organization always needs volunteers. It’s open from 9 a.m. to 2:30 p.m. Tuesdays, Thursdays and Saturdays excepting holidays. 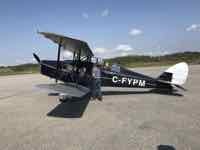 Check their website for updates on developments for a new Wright B Flyer.